Goal races are imminent. Training plans have focussed on tapers with half my athletes racing Ironman or 70.3 events during June and July. I’ve also received a lot of emails about race strategy, pacing and nutrition so the blog is focussing on Ironman racing for the coming month. Starting today with an overview of the taper, the final weeks of preparation for an event. Tapering is a skill. The aim is to reach race day feeling fresh and ready; fatigue from months of preparation gone whilst fitness remains. Truly delivering on this goal is tough – an Ironman taper can require weeks, sufficient time to lose fitness. Training load has to be carefully managed so fitness doesn’t notably decline, but fatigue notably clears. Long course racing may not require the precision of shorter events to achieve a peak, but the right balance will enable a successful race. The topic isn’t new to this blog – I’ve discussed my tapers on a number of occasions, concentrating on the management of a taper utilising the Performance Management Chart (PMC). Used to good effect on my first visit to Kona and with further refinements before racing Ironman New Zealand. The PMC is a useful tool for meeting the aim of losing fatigue whilst managing any loss of fitness. But this time I want to focus in more general terms. As with any aspect of athletic development one size does not fit all, but there are principles that can be broadly applied. I refined my taper over a number of Ironman races, it may not be perfect, but it works for me. I use the same general structure to build my athletes’ tapers, adjusting to fit their circumstances. The fundamentals apply. The final fortnight before a race is officially the taper. Depending on fitness and recent training I may start winding down three weeks back or carry on to a week before. Regardless of an officially taper period I ease back each sport separately. Running first, my last long run normally around twenty days before my race; cycling continuing strongly until a week to go and swimming till a few days out. The time scales reflect the impact each has on my body and the recovery required. Two weeks out there are still sessions that might be considered long and certainly challenging; a leaned down version of a typical peak week. I continue to work on the bike, reducing overall load, but with an emphasis on periods of race intensity in each session. In the water I divide my time between long race effort sets or work at Critical Swim Speed (CSS). I run easy and keep intensity limited, I run better on well rested legs. The taper is steep. Race week is about resting as much as possible. I cut back everywhere, sessions are short, but still contain race intensity work. Overall load is significantly lowered and I plan two full rest days. As the race gets closer the workouts shrink further – I train, throw in a few efforts, then I relax. Race week workouts should be finished on a positive and lift confidence. However I taper I have a set of rules guiding training and behaviour as the race approaches. These override even the most carefully constructed plans. They help ensure I don’t lose sight of the key elements of good race preparation. There is no catching up. Missed workouts are gone, there is nothing to be gained from squeezing them in later. The focus is on rest, we’re not aiming to build fitness. I will miss a few workouts in the final weeks, often just because I don’t feel like it. Get things done. Training, race registration, shopping, whatever the task finish it as early as possible and leave large blocks of time free. A good taper day has an empty schedule in the afternoon. 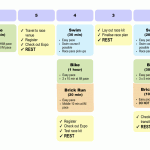 I try to ensure one of my full rest days is completely free – no training and no race admin. Eat well, but don’t over eat. Training volume is down and with it calorie requirements. Advice to eat well before a race doesn’t mean eating a lot, it’s about good food choices. Eat reasonable portions for the day’s workload and rely on this to replenish glycogen stores. I may increase the amount of carbs in my diet, but don’t need to go over board. Be lazy. I don’t go sightseeing; in Kona I filled race week watching reruns of House. Feet up, doing nothing. Training was done in the morning and the afternoon was spent lying down. No stress. You can’t control everything, things will happen that are outside the plan. Worrying because the taper isn’t perfect makes it worse. Apply the rules, find the solution that requires the least effort. If in doubt, do less. Rule number one – if I feel tired I cut back sessions. I pay close attention to how I feel and don’t test myself, that’s saved for race day. I view under delivering as a success. I’m skimming the surface of tapering, but these general rules can help race preparation. The key point is keeping training to maintain fitness whilst reducing the load to allow recovery. Above all else emphasise rest – take every opportunity to do less, even cutting back workouts if you feel tired. I’ll revisit the taper later in the month for a more detailed look at how I plan and structure it.